In order to keep you up to date with new developments at Kasten Marine Design, this page will contain direct links to the most recently added content at this domain. Also, please check out our Plans List web page for new designs that we may have added. 55' Valkyrie - Inspiration for this vessel was Viking craft, Whaleboats and Coast Guard surf boats, all double ended for maximum seaworthiness. Plenty of room for two couples on extended voyages. 32' Terrier - CNC cutting files are being developed... at last the popular 32' Tug Yacht Terrier design will be available in kit form...! 34' Yawl - A rounded hull aluminum sail boat. Simple, rugged, elegant...! Currently under development. 43' White Buffalo - A conversion of our 43' Roberta Jean trawler yacht into a highly capable Motor Sailing Yacht. 48m KLM - A wooden KLM / Phinisi / Motor Sailing yacht for chartering in Indonesia. Design work is under way. Details to be released later in 2018. Interest in Motor Sailing yachts appears to be on the upswing... My preference is that a Motor Sailing vessel should be 100% capable in either mode, whether sailing or motoring long distance (i.e. not a 50-50 yacht...)! 45m KLM - A wooden KLM / Phinisi for chartering in Indonesia. Preliminary design work is under way. Details to be released in 2018. 54' Far Horizon - A rugged all-ocean trawler in the Far Horizon lineage intended for steel or aluminum construction. The interior is ideal for two couples cruising together, or a couple with their adult children. 50' Far Horizon - Another all-ocean trawler in the Far Horizon lineage intended for steel or aluminum construction. The interior is optimum for a voyaging couple with young children, or for a couple who want to accommodate two guests in the aft cabin. 66' (20m) Sulawesi Privateer - A classic brigantine-schooner intended as a charter yacht for a couple, with four guests and four crew. Designed for construction on the beach in Indonesia using top quality tropical hardwoods. 43' White Buffalo - A conversion of our 43' Roberta Jean trawler yacht into a Motor Sailing Yacht. All the same conveniences of the RJ 43, with the economy of also being a highly capable sailing vessel. 43' Roberta Jean - A robust all aluminum trawler yacht. Large double berth forward, U-shaped galley, and a head sufficiently large to contain... a bathtub...! Paravane rig for simple roll attenuation, and an interior that is intentionally un-crowded. 42' Lucille - A ketch rigged motor sailing yacht for sailing all waters from the tropics to the arctic. An interior designed for comfortable cruising, a protected pilot house, and open aft deck for sailing. NC Cutting Files have been developed. 135' (42m) Shadow Line - A wooden barquentine for sail training... The name 'Shadow Line' is from the Joseph Conrad story which describes a 'coming of age' - an appropriate name for such a vessel...! 131' (40m) Arabian Dhow - A Dhow designed for wood or steel construction, able to carry cargo, or able to be transformed into a spacious charter vessel. This prototype / concept design is given a French Lugger rig - a practical solution that is really not so far from the Lateen rigs carried by traditional Dhows. 121' (37m) Peri Laut - A dive charter yacht for SE Asia and beyond to accommodate 16 dive guests in luxury. Steel hull, wood house, or all in fiberglass with a wood surface on the house and throughout the interior. 120' Motor Cargo Yacht - A steel yacht able to carry around 45 tons of cargo to pay its way. A luxury cabin for charter guests to help pay the fuel bill..! Highly seaworthy and very sea-kindly. A unique sort of adventure, and... it's wholly deductible! 118' (36m) Lombok Privateer - A wooden charter yacht for construction in Indonesia. Another in the 'Privateer' lineage, offering superior accommodations in five luxury guest suites with a classic brigantine hull and rig. 88' (27m) Dive Charter KLM - The traditional KLM Pinisi designed specifically for Dive Charters in Indonesia and elsewhere in SE Asia. Five luxury guest suites, a swim deck, and ample crew to pamper guests. 78' (25m) Tern Schooner ODIN - A Bahamian schooner rig. Aluminum construction. Long, lean and lanky... built for both comfort AND speed. A spacious interior for two couples. Designed for all ocean voyaging from the tropics to the arctic. 64' Amethyst - A Tern Schooner with Bahamian rig. Larger sister to the 56' motor sailor, Shiraz. Two completely private full size staterooms with a roomy interior. 56' (17m) Flores Privateer - A classic brigantine schooner designed as a private yacht for a couple, plus two informal guests and four crew. Designed for construction on the beach in Indonesia using top quality tropical hardwoods. 50' Junk Rigged Landing Craft - A true Landing Craft with bow door and all, but rigged as a Junk for fuel efficient cargo transport and landing on the beach without any attendant infrastructure. A cozy cabin for two couples... Wooden construction for building on the beach. 45' Nomad - An aluminum trawler yacht that combines the hull form of our Petrel 43 and Gannet 45 designs, with the house structure of our Vagabond 50 design. A large all-in-one galley / saloon / pilot house for on-deck living with an all-around view. 45' Gannet - An aluminum trawler yacht in the tradition of our Coaster 40, and 43' Petrel designs. A Flying Bridge, in-pilot-house dining, and a spacious galley and saloon. A large owner's cabin forward, plus a guest cabin / office. 20' Launch - Whisper - A trailerable electric launch for day trips or overnight camping. Ample seating for four to six adventurers. The perfect picnic boat..! 42' Lucille - A ketch rigged motor sailing yacht for sailing all waters from the tropics to the arctic. An interior designed for comfortable cruising, a protected pilot house, and open aft deck for sailing. NC Cutting Files are being developed. 45m Kalimantan Privateer (148') - A much larger version of our 17m Flores Privateer, 20m Sulawesi Privateer and 31m Komodo Privateer designs. 60' Swallowtail - A motor sailing yacht designed to carry two in comfort to the far corners of the globe. The perfect Nomadic Watercraft. 35' Big Ferdinand - A larger version of the Ferdinand 24, allowing a private stateroom forward, and the option of having a large open saloon aft. A second stateroom is possible and the layout below is actually quite flexible. 66' Sulawesi Privateer - A classic brigantine-schooner intended for a couple, four guests, and four crew. Designed for construction on the beach in Indonesia using top quality tropical hardwoods. At 20 meters on deck length, it will be very economical to build. 42' Lucille - A ketch rigged motor sailing yacht reminiscent of the great Herreshoff yachts. An interior designed for comfortable cruising, a protected pilot house, and open aft deck for sailing. NC Cutting Files are under development. 120' Leah - II - A modern classic light and fast sailing yacht in aluminum. Fully battened sails, twin keels, shoal draft, and no shortage of luxury for owners, VIP guests, crew and others onboard. 102' (31m) Komodo Privateer - A 31 meter (102') 'privateer' style charter yacht designed for construction in Indonesia. Six luxury guest suites within a smaller overall hull size than our Pinisi / KLM designs. 58' RADIAN - A fast sailing catamaran. Slender hulls for maximum performance, but still capable of supporting the cruising life. 60' GREYHAWK - A sailing catamaran for cruising, chartering, or for long range voyaging. Plenty of room for the whole family. 47' Dinah - A fast modern cutter in aluminum. Designed for ocean sailing, with shoal draft bulb keel and skeg rudder. Generous accommodations for a couple with two guests. 36' Vagabond - A 'pocket trawler yacht' in aluminum. Designed for coastwise and ocean cruising for two in comfort. A large pilot house / lounge and ample accommodations. 61' Mermaid - With the design work completed, our work continues to support the BUILDING of the outstanding Mermaid, a brigantine styled after the classic 1700's privateers. 50' Sarah - A modern fast sailing aluminum cutter in the tradition of our 96' Schooner Zebulun. Fully battened sails, swim step, sleek rounded hull form, and a spacious layout for a couple and their guests. Nice..! 42' Lucille - Smaller sister to my 50' Lucille design, in hull form this ketch rigged motor-sailer is reminiscent of the great Herreshoff yachts, with an interior designed for comfortable cruising. 36m (118') Arabian Dhow - Designed for luxury charters in the Arabian Sea, serving Dubai and Oman. Ample room for eight charter guests, plus a large deluxe suite for the owners. 82' Schooner Royalist - A replica of the original Royalist, owned by the first White Rajah of Sarawak James Brooke. Intended for construction in Kuching, Sarawak, Malaysia. 66' Sulawesi Schooner - A classic schooner intended for a couple, four guests, and four crew. Designed for construction on the beach in Indonesia, its cost would not be much. 55' Euro Express - A fast semi-planing motor yacht for the Mediterranean... A flying bridge that still allows full access to the EU canal system... Two luxury cabins... 20 to 22 knots on tap. Good..! 48' Awahnee III - An adaptation of the slightly larger Uffa Fox designed Awahnee I and Awahnee II sailed by Bob Griffith and family on three circumnavigations, here planned for construction in steel. 43' White Buffalo - A motor sailing yacht virtually identical to our 43' Roberta Jean. The perfect live-aboard layout for two...? Very possibly. 38' China Cat - A capable offshore centerboard yacht in a classic package. Plenty of interior room, and worldwide access to waters over 4 feet in depth. The perfect live-aboard yacht...? 28' China Cat - A small junk rigged yacht with fantail stern and flush deck type of cabin. The ideal pocket cruiser...? Possibly..! 66' Asgard - A Viking Ship...? Yes - having been inspired by those craft, the Asgard is so named. A double ended hull with survivability in ultimate conditions, but also... a touch of luxury for two couples..! 61' Mermaid - Work continues toward BUILDING the outstanding Mermaid, a brigantine styled after the excellent 1700's privateers. 44' Valhalla - Inspiration for this vessel was Viking craft, Whaleboats and Coast Guard surf boats, all double ended for maximum seaworthiness. Plenty of room for living aboard. 42' Lucille - Smaller sister to my 50' Lucille design, in hull form this ketch rigged motor-sailer is reminiscent of the great Herreshoff yachts, with an interior planned for comfortable cruising. 33' Freyja - The assignment here was to create the smallest, most seaworthy live-aboard vessel possible, and to do so without crowding the interior. 82' Peregrine - A long and sleek motor-sharpie type with aft pilot house. An extended version of our 64' Peregrine prototype suited to all-ocean cruising, or the canals and rivers of the world. 80' Fantail Steamer - A classic fantail yacht harking back to the days of the steamer. An all-ocean classic yacht. 70' Peregrine-on-Thames - An extremely shoal draft sailing "barge" somewhat along the lines of the classic Thames Sailing Barges, but built in aluminum or steel, and having a fantail stern. 70' Arabian Dhow - A traditional "Baghala" type of Arabian Dhow arranged as a private sailing yacht with two guest staterooms. Wood plank-on-frame structure or cold moulded structure. 36' Molly - A compact 'Dream Yacht' intended for simple construction in steel or aluminum, economical propulsion, and a spacious layout for two to live aboard. The ideal canal cruiser...! 30' Ernest Shackelton - A rescue vessel...! Intended to be the ultimate trailerable and floatable home in the event of natural or unnatural disasters. Mermaid 61 - Work continues on an all aluminum brigantine styled after the 1700's privateers. Wow..! Far Horizon 46 - A stout all-ocean trawler designed for a family of four with world cruising capabilities. Construction in steel or aluminum. 37m (120') Chief Seattle (120') - A classic Grand Banks racing-fishing schooner styled after the Bluenose, but planned for construction in aluminum...! Cleopatra's Galley - A 100' true Egyptian ship of state from the age of Cleopatra for dinner cruises in and around Singapore, driven by... oars..! Amazon 100' - Conceived as a medical supply vessel, but quite adaptable to a low profile yacht or tour boat, especially well suited to shoal water and low overhead clearance of river systems and canals of the world. 100' North Coast - A motor yacht of generous proportions for world cruising. 85' Lady Destiny - An expeditionary sailing junk in steel, intended for an extended family of 8 people, or for luxury charters. 80' Trawler Yacht - A plumb stem low profile trawler yacht somewhat in the Lapworth tradition (see Voyaging Under Power, first edition, p.80). 80' Power Trimaran, TROIKA - A uniquely styled modern trimaran for voyaging under power. The comforts of a true pilot house. Simplicity of propulsion, and an optional get-home sail rig. 49' Black Jack - Another in the Rhumb Runner series, this time using a unique hull form derived from a sailing Skipjack..! 48' Spray - Revisiting Joshua Slocum's original Spray. Can it be improved...? 48' Hiawatha - An aluminum ketch with a hull form in the tradition of the fast Grand Banks schooners, with an interior planned for comfortable cruising and living aboard. 43' Far Horizon - A stout all-ocean trawler intended for steel or aluminum construction. 43' Petrel - A widebody dive yacht for worldwide travel. Similar to our Coaster 40 design, but with a wide saloon and integral swim platform. 41' Jasper - A motor-sailing ketch for comfortable cruising whether on the ocean or on inland waters. A pilot house, plus generous sleeping accommodations. 40' Far Horizon - Another prototype in the Far Horizon series... a robust all-ocean trawler yacht with live-aboard comfort for a couple and occasional guests. 32' Pilgrim - A fantail cutter intended for construction in steel, aluminum or plywood. Two sizes, most recently at 32' on deck. 30m (98') Wooden Sailing Pinisi - A plank-on-frame Indonesian Pinisi Schooner. Now under construction, Borneo. Mermaid 61 - An all aluminum brigantine styled after the 1700's privateers. 42' Zephyr - A simple and graceful steel ketch for ocean voyaging in style and in comfort. Updated sail rig and new images. 48' Jasmine - An aluminum junk schooner with electric drive. Newly updated to include pilot house option. 36' Drifter - An economical habitat for our trying times: An easily built houseboat...! Newly updated content. 37m (120') Chief Seattle (120') - A classic Grand Banks racing-fishing schooner. 38m Indonesian Pinisi (125') - plank-on-frame Indonesian Sailing Pinisi Charter Schooner. Now under construction, Borneo. 34m Royal Albatross (110') (33.5m) - New interior layout and revised exterior styling for the sail training vessel "Windy II" now renamed "Royal Albatross." 33m Indonesian KLM- A plank-on-frame Indonesian Motor Sailing Yacht, for charter or for private use. 56' Aluminum Ketch - Shiraz - A gaff ketch reminiscent of Herreshoff. Now under construction, the Philippines. 55m Lady Destiny(180') - A steel mega-yacht / junk schooner with classic Asian styling. 40m KLM Charter Yacht (132') - A plank-on -frame Indonesian Pinisi / KLM type configured for improved sailing capability. 65' Rachel - Modern aluminum sailing yacht. New images with an alternate interior and aft deck arrangement. 50' Amazon - A steel shoal draft live-aboard river boat - perfect for the ICW in the USA. 32' Skimmer - A small cozy pocket trawler in aluminum, capable of semi-displacement speeds. 50m (164') Wooden Charter Yacht - A plank-on-frame Indonesian Sailing Pinisi Charter Schooner. 36m (118') Wooden Tern Schooner - A plank-on-frame wooden Three Mast Schooner. 30m (98') Wooden Charter Pinisi - A plank-on-frame Indonesian Pinisi Schooner. 80' Aluminum Motor Yacht - North Coast - An all-ocean Diesel-Electric motor yacht. 64' Steel 'Clipper Yacht' - Chantage - Classic Motor Sailor. 60' Aluminum Motor Yacht - Swallow's Nest - An all-ocean expeditionary Motor Sailor. 56' Aluminum Ketch - Shiraz - Fast sailing in a ketch reminiscent of Herreshoff. 48' Aluminum Schooner - Jasmine - Electric Drive Sailing Yacht. 43' Aluminum Motor Yacht - Roberta Jean - Motor Yacht for voyaging. 100' Wooden Bermuda Skipjack - A design concept for ocean sailing in a classic wooden hull. 78' Wyldepathaway - A classic fantail schooner in steel for charters. 65' Rachel - A sleek and modern aluminum design for fast ocean sailing. 47' Aluminum Motor Yacht - Roberta Jean - Classic twin-cabin Motor Yacht in aluminum. 43' Aluminum Motor Yacht - Roberta - Motor Yacht for voyaging. 32' Steel Tug Yacht - Talisker - A Tug Yacht prototype. 50m (164') Indonesian Sailing Pinisi - A plank-on-frame Pinisi Schooner for Chartering. 118' Tern Schooner - A yacht with an owner's private 'great cabin' aft and four guest suites. 80' Motor Yacht, North Coast - An all-ocean Diesel-Electric aluminum motor yacht. 64' Steel Clipper Yacht, Chantage - Classic Motor Sailor. 48' Aluminum Schooner, Jasmine - Electric Drive Sailing Yacht. 32' Steel Tug-Yacht, Terrier - Stock design now on the water in Turkey. 50m (164') Indonesian Charter Yacht - An Indonesian KLM Yacht for charters. 135' Shadow Line - A plank-on-frame Barquentine. 125' Blackbeard - A classic wooden "privateer" yacht. 112' Sailing Yacht, Leah - A modern yacht for luxury and fast sailing. 70' Express Cruiser- Like the rum runners of yore - fast, sleek and classic. 36' Blue Horizon - A compact all-ocean fantail-stern trawler-yacht in steel. 60' Sarah E. Banks - Iron Steam Yacht Restoration. Why Use NURBS Modeling...? Why we use SURFACE modeling to design boats, rather than SOLID modeling. Once in a great while we get to go on some sort of adventure. You can review some of that wildness among the following links. In 2001, I traveled to Indonesia to research the wooden boat building methods of the Bugis / Konjo boat builders of South Sulawesi. 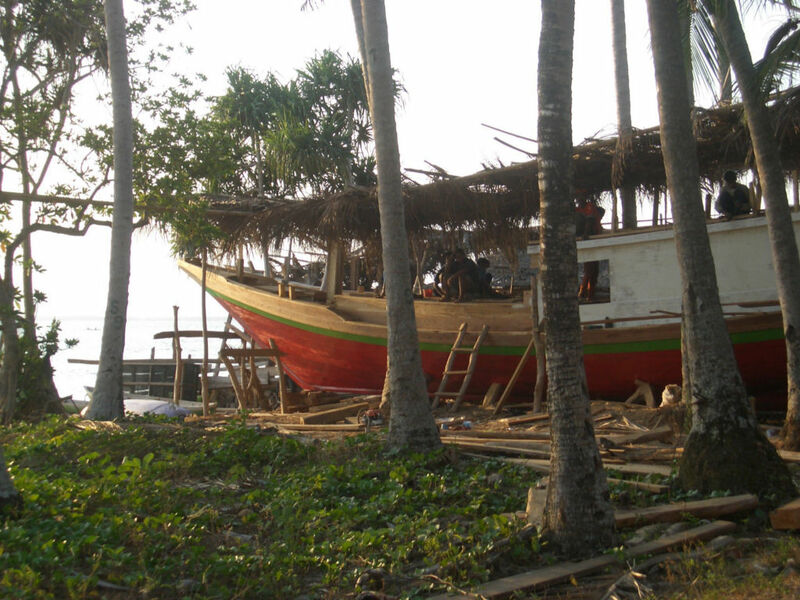 This adventure took us from Bali to Sulawesi to meet the builders, and then from Sulawesi to Kalimantan (Borneo) to visit an active boat building site. While in Kalimantan we lofted the shape and built the mould frames for a traditional wooden Indonesian Pinisi, the 36 meter Silolona, the design of which we completed during 2001 and 2002. 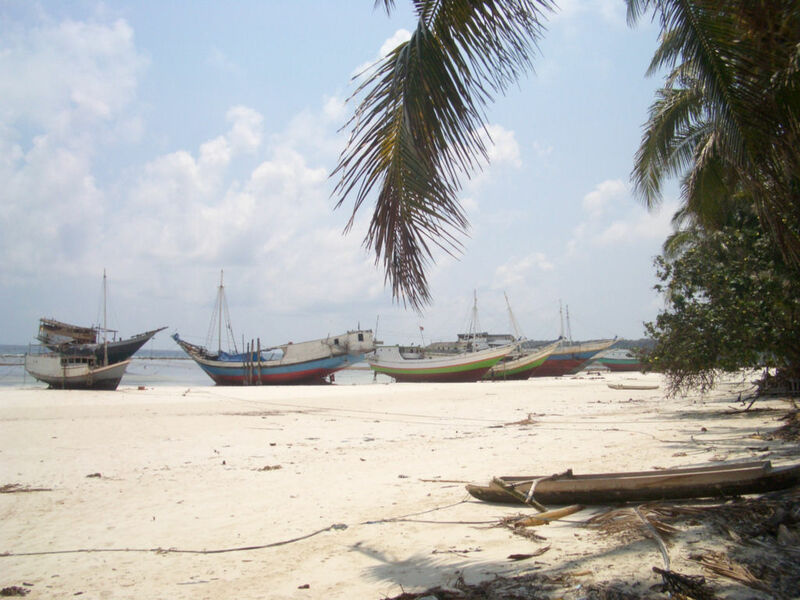 At the end of 2004 I traveled to Indonesia and sailed for several weeks aboard the Silolona. It was an excellent trip! You will find more of that story on our Silolona Homecoming page. During the spring of 2006 LI once again visited Indonesia to begin construction of a new 36 meter Indonesian Motor Sailor the Dunia Baru. We traveled to Sangkulirang, Kalimantan Timur (East Borneo) where we lofted the shape and built the mould frames in the equatorial heat..! We did get a nice trip up the Sangkulirang River afterward among the proboscis monkeys, hornbills and caymans. Wild..! A few select images from our various trips to Indonesia can be seen at our web page on Boatbuilding in Indonesia - A Photo Gallery. For a bit of background about these incredible wooden vessels, please check out our article on the Evolution of a Traditional Wooden Sailing Type and the links that follow the article. Thank you for your interest in our work...!